Slice rolls, spread evenly with equal parts of Dijon mustard and mayonnaise. Layer with meat, red peppers, greens, and then top with jalapeños and cheese slices. Close the sandwich and butter the outsides of the rolls. 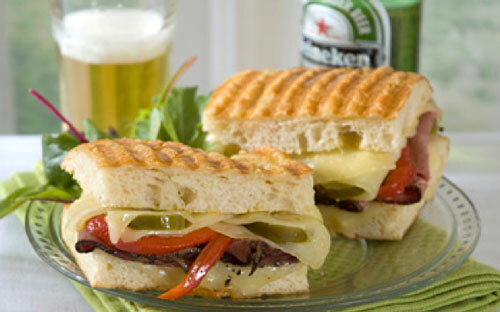 Put the sandwich in a heated Panini press and cook for 5 minutes, or until cheese is melted and bread is crisp.